I very recently bought a new firearm, a Gen 3 Glock 19 to be exact. The Glock 19 is my replacement for my SCCY CPX 2 that I used to conceal carry. 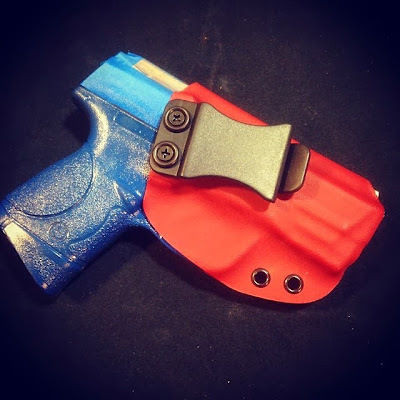 Now that you know there very short back story, I will talk about the holster. What Squared Away Customs does. 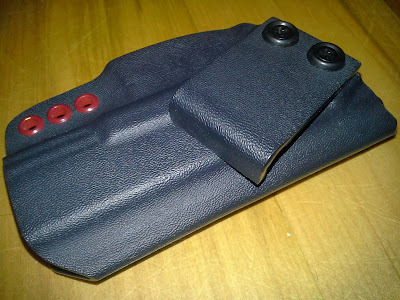 "High quality custom made Kydex holsters, mag pouches and sheaths for all types of carry. 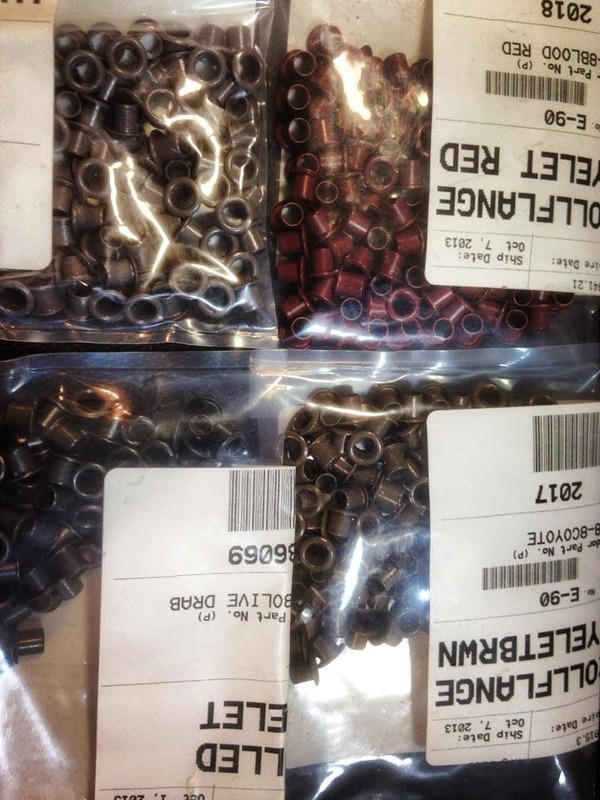 100% made in the USA." KYDEX is a line of thermoplastic acrylic-polyvinyl chloride materials. It has a wide variety of applications, including for firearm holsters and sheaths for knives. Everything Squared Away Customs does is completely custom made, much like there name implies. 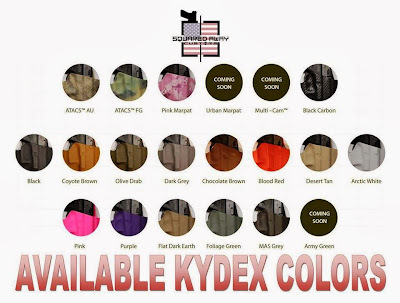 You can choose from many colors of Kydex, and rivet colors. I chose black Kydex, with Blood Red Rivets for some flair. My holster came gift wrapped. This is what is under the pretty paper, minus the Glock 19. Now for the pros and cons. Concealability is very good. It is basically not visible on my body, I am wearing a very thin Old Navy shirt. 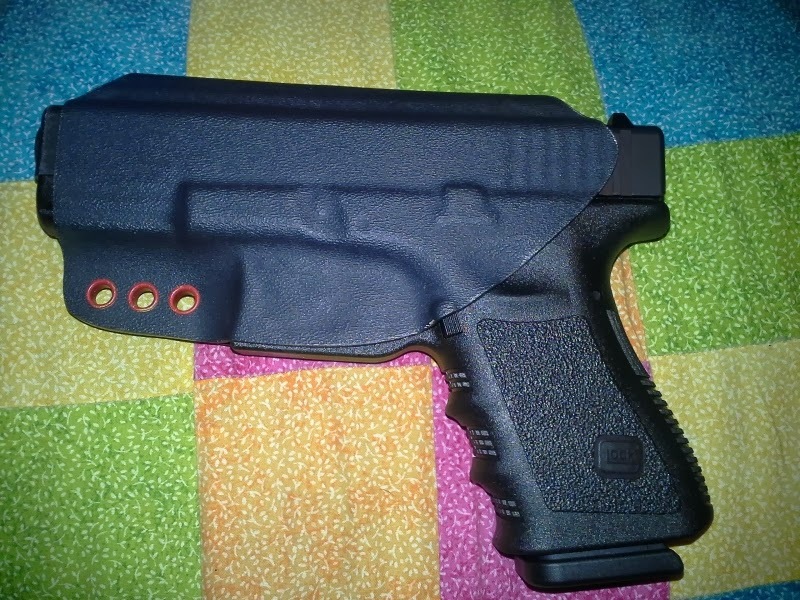 The holster is extremely comfortable, so comfortable I have taken a few naps wearing it. Drawing from holster feels good, and the angle is very natural too grab my Glock 19. 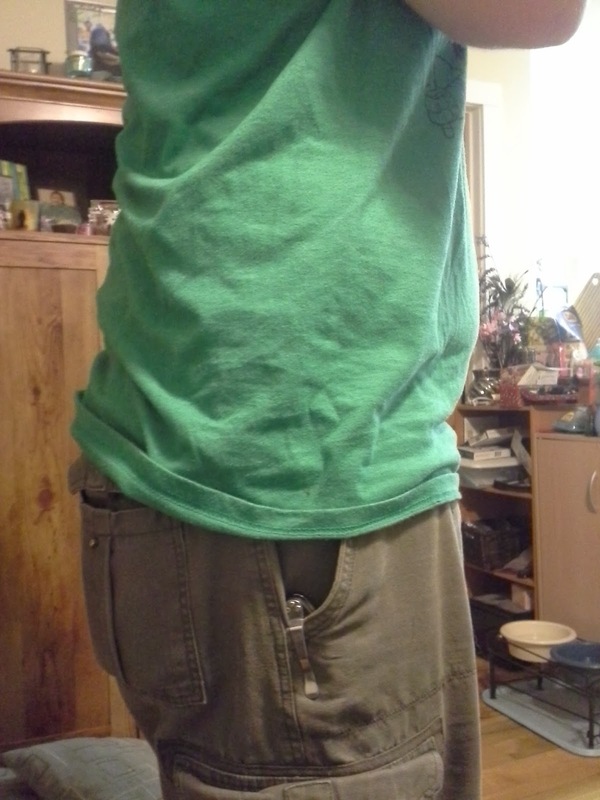 The first and most noticeable con for me is removing the holster from my person at the end of the day. 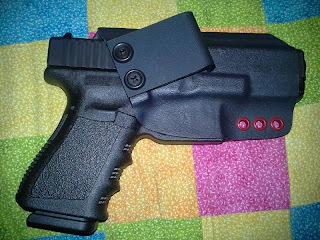 The clip design on my holster is very hard to slide over my waist band and belt. There is no real good way to grab it to remove it, it is still do able but it is difficult. It is also impossible to pull the clip over my belt with the gun in the holster. You can slide the belt out of the loop but I find that to be inconvenient. It seems like just a week after I received my holster Squared Away Customs Solved this problem by changing the design of the belt clip. New Squared Away Customs Clip. 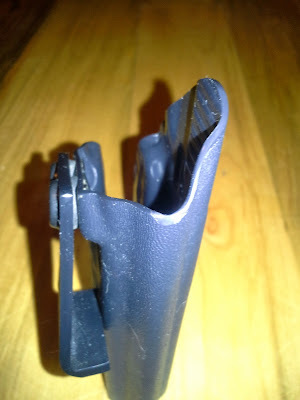 The new clip appears too have 2 nice reliefs in it that probably takes a lot of the stiffness out of it. There also appears to be a nice place to put your fingers to pull up on the clip. 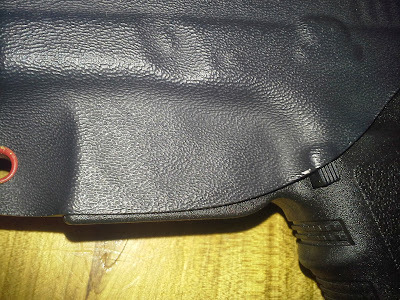 I wish there was more definition on the kydex around the trigger guard. Like the picture below. I find there would be more retention in the holster, if all the holsters they produced held onto the gun around the trigger guard. The holster above looks like the perfect holster to me, with the new clip and the retention around the trigger guard, sadly it is not mine. Now for the finish of the holster, initially it appears to have a really good finish but I have a eye for detail verging on extremely nit-picky. 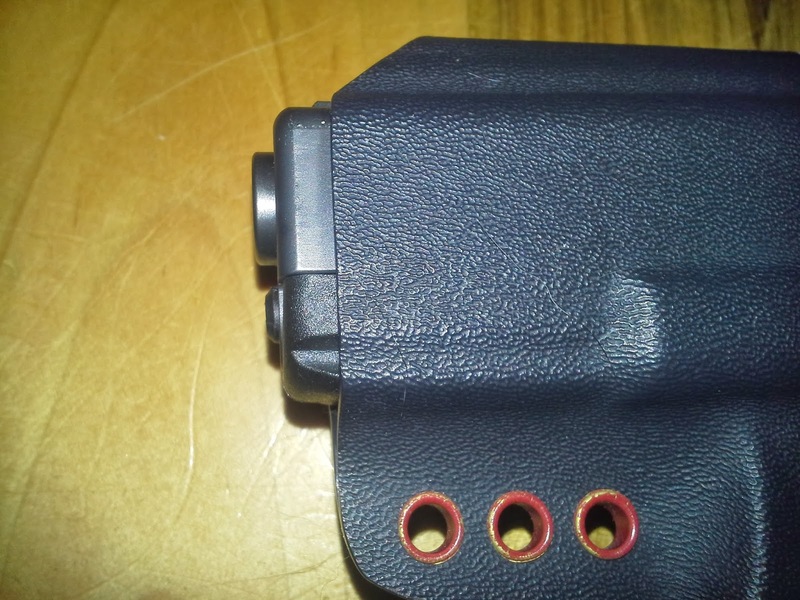 There is 2 spots on the whole holster that I noticed a tool markings. 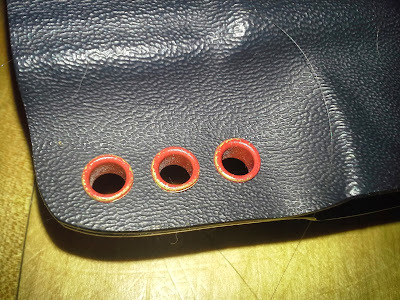 Paint has been removed on the rivets. Marked from sanding or a dremel. I would have preferred the trigger guard more defined like I said above and also more material covering it. I find the muzzle of my Glock 19 protrudes longer than I would have normally liked. My final thoughts on the holster. 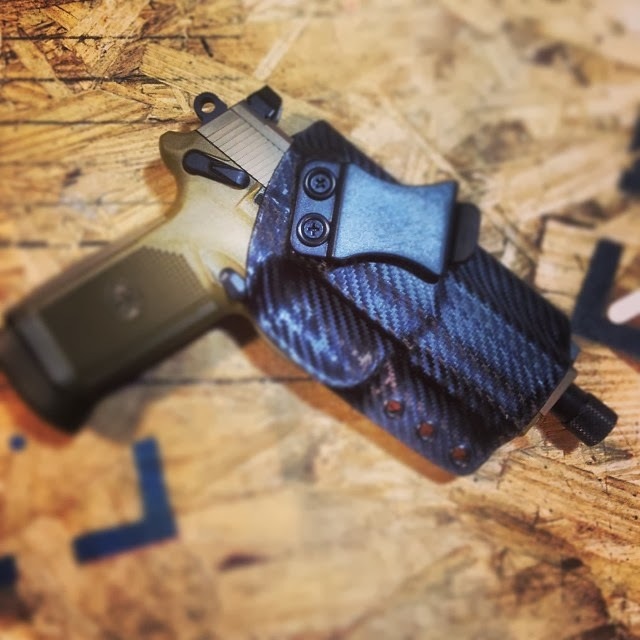 The Squared Away Customs IWB holster is very comfortable and functions as it should. The holster could be better in my opinion, and it looks like mine just missed some improvements in design by just one week. I paid $60.95 including shipping for my custom holster. I am satisfied with the holster, and it does its job. My words may be a little blunt, but I found the holster a little lacking in the finest details. 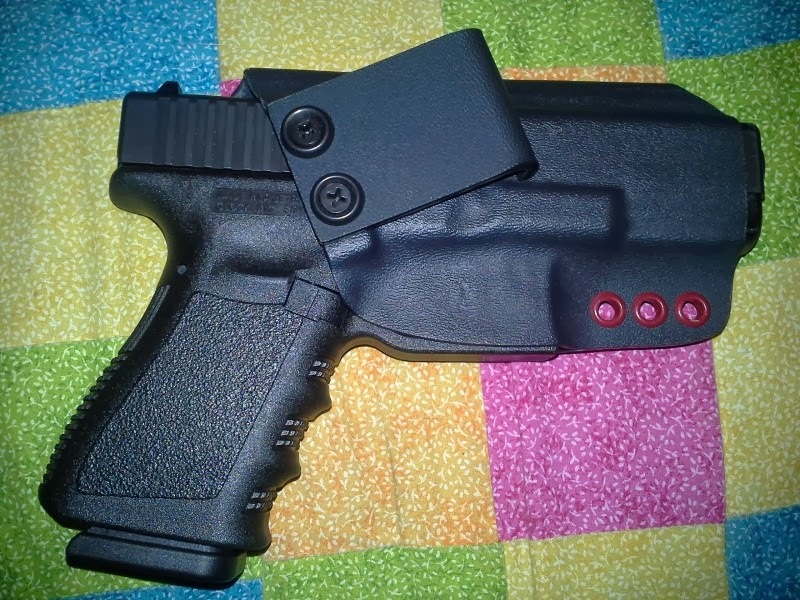 If I had to give it a rating out of 10, I would give this holster a 7. 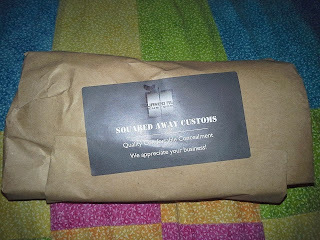 I do highly recommend Squared Away Customs, for all your retention needs. 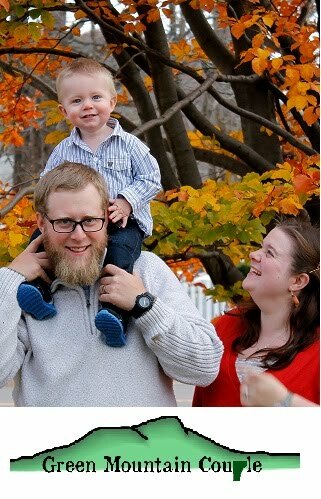 You can contact Squared Away Custom through there facebook page Squared Away Customs.